I’m happy to announce my first guest blogger, Riki Shore! And lemme tell you, she ain’t no ordinary Paleo food blogger. Although Riki’s a classically trained pastry chef who worked at Charlie Trotter’s, she’s crossed over from the dark side. She’s now devoted herself to writing about delicious gluten-free fare at her blog Three Squares, on the South Pasadena edition of Patch, and on Robb Wolf’s site. On a recent trip to Vancouver, my daughter had her first exposure to Middle Eastern food (that is, if you don’t count grocery store hummus, which she happens to love). She couldn’t stop eating the lamb shawarma, which, unfortunately for her, belonged to someone else at the table. Once home, it didn’t take long for her to ask me to make her shawarma. The name shawarma actually refers to the cooking method, as well as the spices and herbs used. Much like a rotisserie chicken, shawarma is prepared over a spit. Slices of marinated meat (lamb, chicken, or beef) are stacked on a spit with layers of fat in between and a tomato and onion placed at the top. The spit then rotates over a fire, cooking the meat to juicy perfection. When you order shawarma, the vendor slices the meat directly off the spit onto your plate, and adds tomatoes, onions, cucumbers, warm pita, hummus and a deliciously garlicky sauce called toum. To approximate this at home, I first marinated slices of lamb overnight. The next day I broiled them briefly and served it up with a homemade tahini garlic sauce, and oven-roasted zucchini and yellow squash. Our dinner plates were garnished with feta cheese and fresh chopped mint. My daughter, who likes to rate my cooking, gave it a 10. 1. Combine all ingredients in a Ziploc bag, shake to evenly distribute the marinade, and refrigerate overnight, or up to 24 hours. 2. 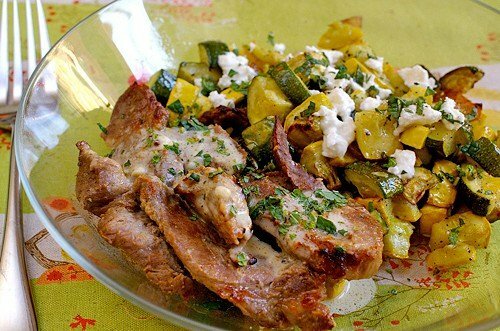 Allow lamb to rest at room temperature 15 – 20 minutes before broiling. Preheat your broiler to HI and set the oven rack about 3 – 4 inches below the flame. 3. Broil lamb in an even layer on a broiler rack or foil-lined sheet tray for 5 – 6 minutes on each side, until cooked and just crispy at the edges. Serve hot, with accompaniments. Combine all ingredients except parsley in a small bowl and mix well. Start with the smaller amount of water and add more to achieve the desired consistency (I like a pourable sauce). Add parsley just before serving and mix well. 2. Spread the vegetables in a single layer on a sheet tray. 3. Sprinkle the salt and pepper over the vegetables, then drizzle on the olive oil. Using your hands, toss gently until all the vegetables are evenly coated. 4. Roast for 30 – 40 minutes, tossing the vegetables and rotating the pan halfway through. If desired, place the tray under the broiler for a few minutes to achieve a nice caramelized finish. 5. Serve, topped with crumbled feta cheese and freshly slice mint.